Protect your Apple iPad Pro 12.9 with the stylish, attractive, black DropTech Case from Gumdrop. 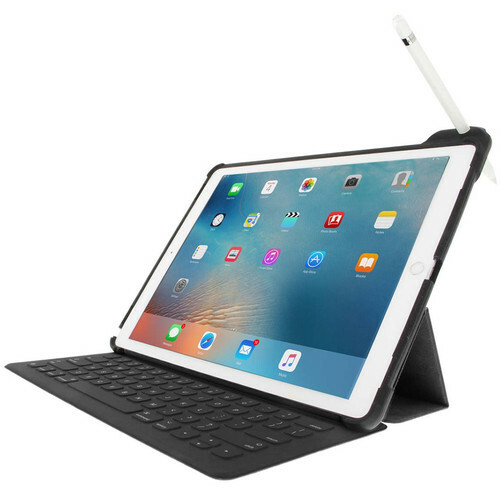 This well-designed case features a built-in Apple Pencil slot and full integration with an optional Smart Keyboard. Installation is snap-on simple. The case has cutouts to provide full access to ports, buttons, and the camera. For impact-resistance there are rubber bumpers on the corners of the dual-layer silicone/nylon construction. And for safety and comfort the case has a textured, graspable surface. Box Dimensions (LxWxH) 13.3 x 10.4 x 1.2"
This case weighs approximately 0.86 lbs. So, what is the optional keyboard for this case? Is it a Gumdrop product, the Apple keyboard, or something else? Without the keyboard, does this case cover the screen when closed? This unit does not include a keyboard. It is just a shock proof case. There is also not a stylus included. Do not waste your money.